I sometimes pick out a lip gloss or lipstick solely because I like the decorative tube. Am I alone in this? Probably not. 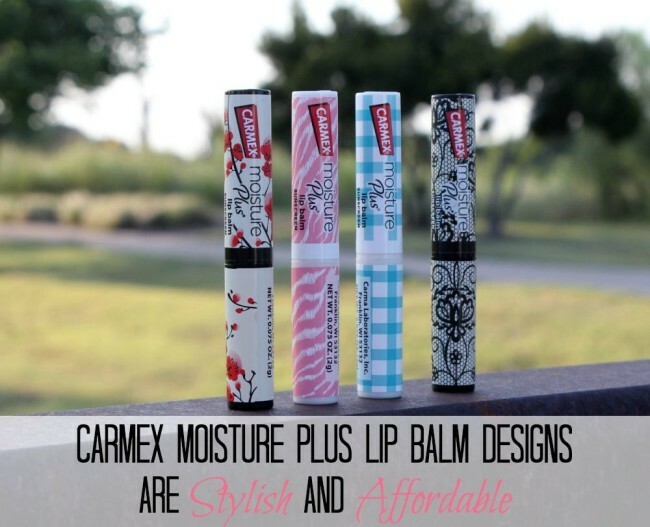 So when I saw the new Carmex Moisture Plus Lip Balm Designs, I was excited. 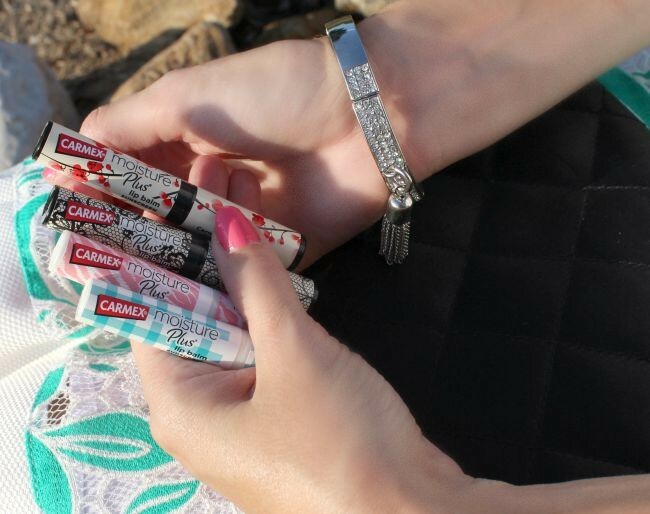 Why would stylish lip balms get me excited? Because not only are they pretty, but I’ve been using Carmex with their iconic yellow lid since I can remember. It’s a brand I know and trust, and now one that fits seamlessly into my personal style. Whether I’m headed to the pool, running errands or out to dinner – I can grab a tube of Carmex Moisture Plus lip Balm and throw it into my bag. In the summer my lips dry out due to the sun beating down on me. In the winter, it’s that cold blowing air that gets you right in the face. Carmex provides lip and skin care tips on their website, giving you information on topics from chapped lips to dry cracked feet. I love how each of these designs seem to fit in with different styles I may choose. The pink and blue tubes are perfect for a casual day out, while the cherry blossoms and black lace designs fit in well with a dressier occasion. The cherry blossoms with my green lace Shabby Apple skirt is so cute. Where does Carmex get their inspiration for the colors and patterns? Straight from Pantone’s official color forecast and from prints and textures seen on the fashion runways. How about a sneak peek at the NEW fall/winter designs that will be on shelves this fall, starting in October 2015? I know what you’re thinking…CUTE! I’ve been using and toting a tube or two around with me and it’s so nice to have something sleek, pretty and that fits in my makeup bag so perfectly. Not to mention the amazing feeling of moisturized lips with the ultra-hydrating formula of Carmex. After one application, they are so soft and smooth. As an added bonus there’s a hint of vanilla flavor and SPF 15 protection. To apply, just twist the tube and pucker up. You can buy Carmex Moisture Plus for the low price of just $2.49 at the checkout lanes of Walmart, Walgreens and Dollar General. Next articleBack to School Beauty Favorites, Plus a $100 Target Gift Card Giveaway! 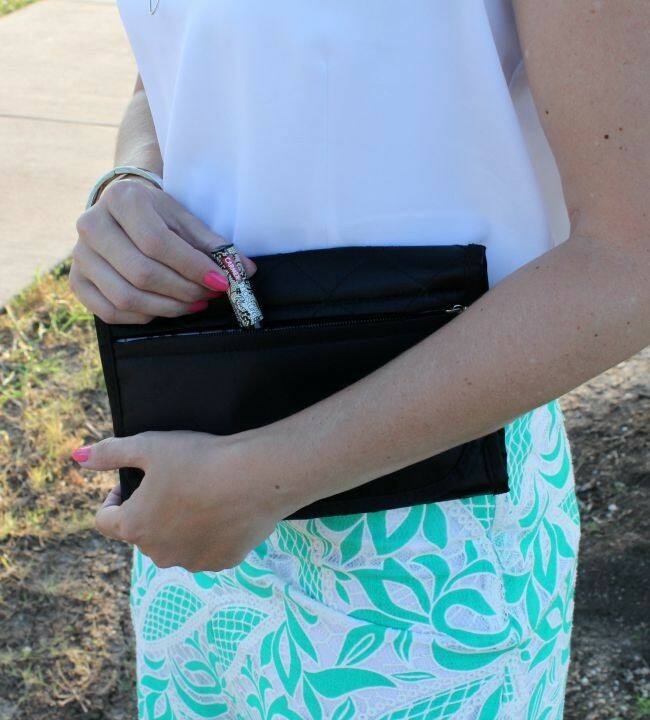 The lipbalms look great and I love your skirt!